Step out of the city life by going to Eurwangni Beach and Nami Island. 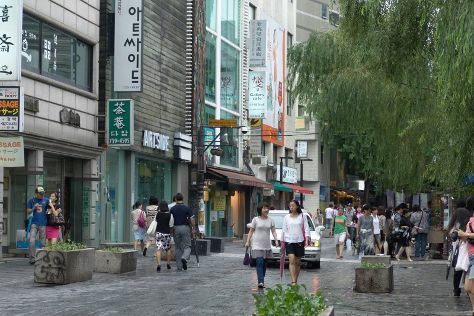 Do some cultural sightseeing at Cheonggyecheon Stream and Insadong. Venture out of the city with trips to Hwaseong Fortress (in Suwon), Ilsan Lake Park (in Goyang) and Paju (The Third Tunnel & DMZ). Spend the 1st (Sun) exploring nature at Bukhansan National Park. Pack the 8th (Sun) with family-friendly diversions at Lotte World. The adventure continues: step into the grandiose world of Gyeongbokgung Palace, take a stroll through ฺฺBukchon Hanok Village, shop like a local with Namdaemun Market, and make a trip to Myeongdong Shopping Street. For where to stay, more things to do, reviews, and more tourist information, refer to the Seoul itinerary planner. If you are flying in from United Kingdom, the closest major airports are Gimpo International Airport, Incheon International Airport and Cheongju International Airport/Cheongju Air Base (K-59/G-513). In March, plan for daily highs up to 13°C, and evening lows to 1°C. Wrap up your sightseeing on the 11th (Wed) early enough to travel back home.